I feel relaxed, peaceful, and calm even if I’m overwhelmed with deadlines to meet and e-mails to reply to. What’s happening with me? I’m just returning from a week of sailing through the Bahamas – that’s what. Last week, E and I joined three of our friends for a cruise through the exotic islands of the Exumas. Two of our friends own a sailboat here in Quebec and are experienced sailors. An incredible opportunity arose to join them on a beautiful, private 36’ sailboat, cruising through crystal clear waters in out-of-this-world shades of blue, visiting deserted beaches, observing marine life through our snorkeling masks and . . . eating delicious meals made in our teeny-tiny sailboat kitchen. Early on, before the adventure began, I volunteered to be the cook for the week. I knew it would be a challenge, and I was curious to discover the limitations and factors to consider when cooking out at sea. Plus, we had to plan all meals in advance (including breakfasts and all snacks), because our only opportunity to grocery shop would be prior to departing from the Nassau marina. It was therefore essential to write up a precise list of what was needed and put together another, itemizing what we could bring along with us from home. Before we left for the Bahamas, I prepared a spreadsheet that I shared with my friends so everybody could tell me their thoughts about the menu and point out anything I might have forgotten. As I searched the Web for advice about cooking on a boat, I gathered tips that proved to be very helpful in planning a week’s worth of meals for five food-lovers. People tend to be hungrier at sea. Think about it: sitting at your desk, little more than your hands move throughout the day. On a boat though, you’re managing the ropes or the sails, you’re at the helm, or you’re just sitting around, your muscles compensating of the movements imposed by the sea. To make sure nobody’s dying of hunger by dinnertime, serve healthy snacks throughout the day (fruit, nuts, crackers, etc.). Ask for your fellow travelers’ tastes and diet restrictions before you leave. 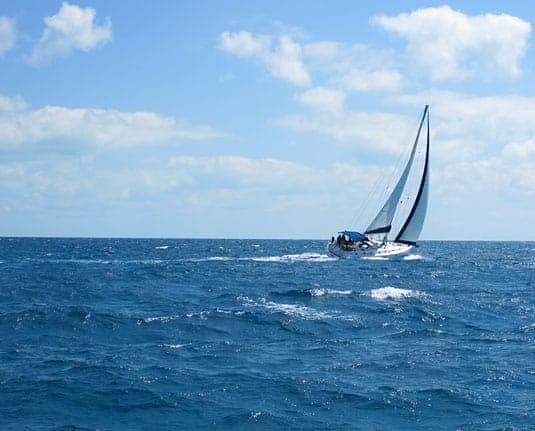 Out at sea isn’t an ideal time to suffer from an allergic reaction. And, the kitchen is so small that you won’t want to cook an alternate dish for the person who doesn’t like what you planned. Plan the meals according to the equipment you have on the boat. 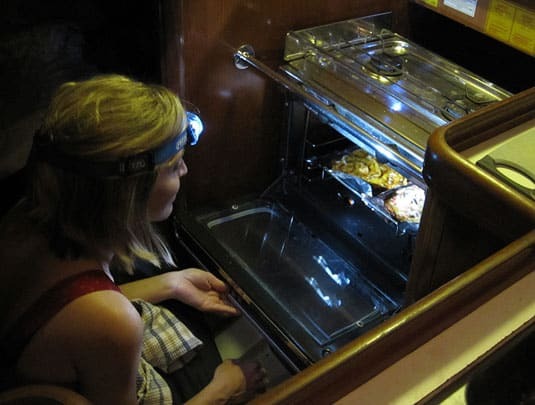 This may seem very obvious, but what if you plan for meals to be cooked in an oven, and you don’t have an oven on the boat, as it is often the case? Or, you only planned for barbecued meals, and your BBQ breaks down? Ask for a precise list of everything that exists on the boat. Don’t take anything for granted: for example, chances are no coffee maker or a toaster will be on board because of power restrictions. You need to diversify your meal options. Make a (very precise) list. Don’t just write “onions;” estimate exactly how many onions you’ll need. Not only will you avoid unnecessary waste, but you’ll save time at the grocery store by eliminating the need to stop before every ingredient you need to buy, attempting to figure out how much you need. Bring your favorite kitchen tools with you. 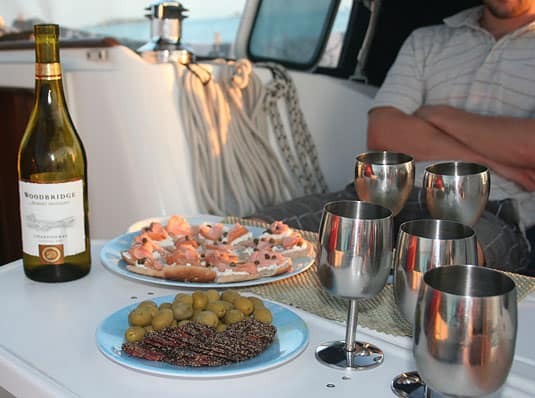 Rental boats are equipped with the minimum of kitchen tools, and knives are known to be especially bad (people use them for anything and everything, from cutting bread to rope.) 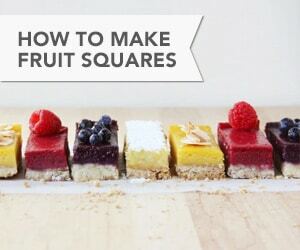 Bring your favorite knife, a small and clean cutting board, a good-quality corkscrew, and any other small tool or gadget you think you may need to prepare your meals; it’ll make your life tremendously easier. Bring everything you can from home. If you can fit it in your luggage, bring spices, canned food, snacks, and everything else that’s sold vacuum-packed or sealed. You probably won’t be able to find everything you need at your destination’s grocery store, and chances are that things are a lot less expensive at your neighborhood’s grocery store than wherever you plan to go sailing. Don’t forget that storage space is very limited. Especially in the fridge. Most often, there’s no freezer, or just a small corner of the fridge is dedicated to it. Favor liquids that can be stored at room temperature like Tetra-packed pasteurized juices and UHT milk. Balance out meals based on the freshness of ingredients. Plan for meals made with perishable foods as well as others made with canned ingredients. Eat the most perishable foods first, and keep the meals based on canned foods or ingredients that keep well at room temperature for the end of the trip. Be very careful with meat and eggs. If available, buy frozen meat; they will defrost gradually in the fridge, allowing you to keep it fresh (and fit-for-eating) for a longer period of time. Plan for lunches that can be prepared in advance. 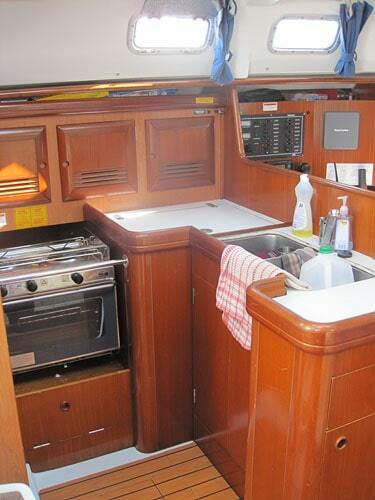 Do not think you’ll be able to cook while the boat is at sea. You probably won’t. Even on an exceptionally calm sea, a boat is a boat, and by nature, it’s ever moving. And, if you’re like me, you probably won’t even be able to get up and serve food, because you’ll be seasick. 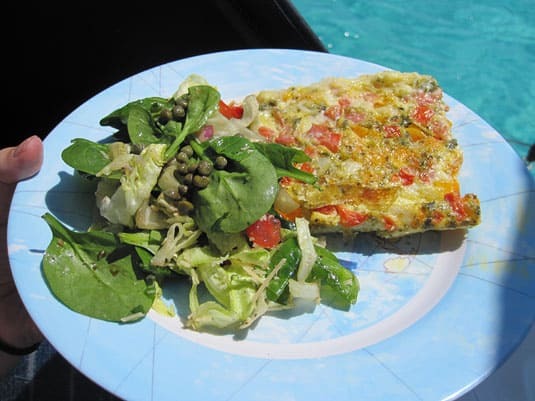 Make sandwiches or salads in the morning when the boat is anchored, and be certain the food is easy to reach in the fridge so that anyone can go grab the lunch if the cook isn’t feeling too well. Ask about the garbage disposal restrictions and allowances. We knew we wouldn’t be able to get rid of our trash prior to the end of the trip, but nobody informed us we could dispose of all organic trash in the sea. Had we known, we would have avoided (really) bad smells toward the end of the week. In the Bahamas, everything you would put in a compost bin can be thrown out at sea. The sheer quantity of groceries we had to store into the boat was frightning at first, but we managed to fit everything in (photo by Pierre-Luc Jodoin). 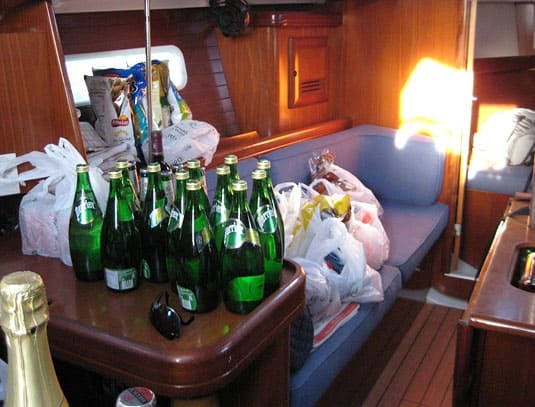 A boat featured a lot of hidden storage: water gallons under the seats, wine bottles into the table, beer cans under a floor panel (photos by Pierre-Luc Jodoin). A headlamp proved to be a very helpful gadget to help me watch over the pizzas in the oven which had no interior light. Whatever your destination, cooking at sea is a thrill, and I really enjoyed it. I cooked in the smallest kitchen I’ve ever worked in, but with a little ingenuity, I was able to make everything just like I would have at home. I even made chocolate cupcakes for E’s birthday! I had excellent guests who loved everything I made and also doubled as wonderful helpers: Not once did I need to take care of cleaning up after meals – what a dream! We didn’t waste much and never went hungry. It was a unique trip, and I loved every minute I had the chance to cook on this beautiful sailboat. For your curiosity, I leave you with our menu. You’ll see that we didn’t sacrifice taste for practicality! 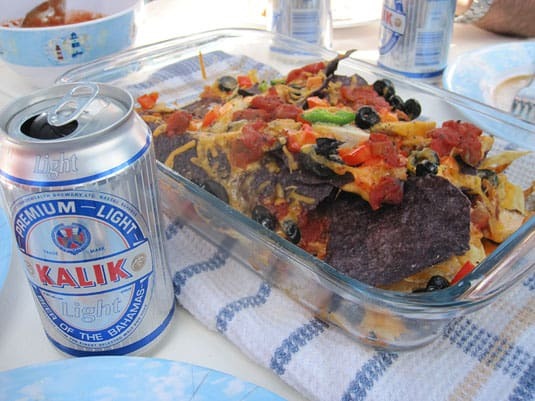 Nachos go well with a refreshing Kalik, the beer of the Bahamas! A fancy happy-hour with white wine, black pepper dry sausage, green olives and smoked salmon canapés (photo by François Carpentier). 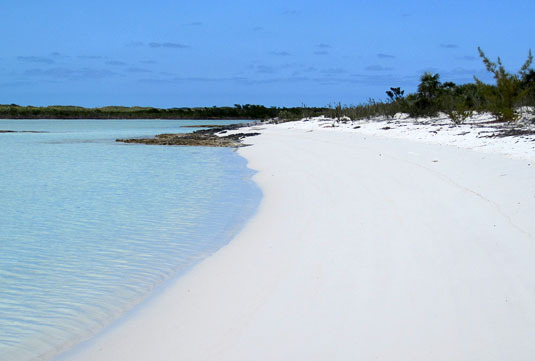 The most beautiful beach in the world at Shroud Cay. 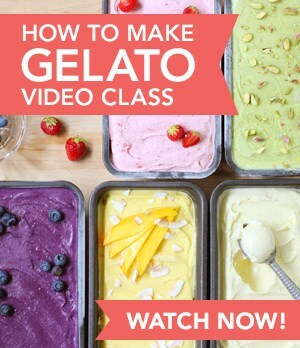 Gabrielle Hamilton / Yotam Ottolenghi Giveaway Winners! Congratulations! I will soon get a hold of you to make sure you receive the books as soon as possible. I loved this post and I am always looking for more info about cooking on board. Last year 32 people in our sail club took off for the Aeolian isles off the coast of a Italy we had 3 fifty foot boats and seven days. We planned a year ahead meeting every few months. This helped us get to know one another better and by the time we set sail we were all pretty good friends. We had a blast cooking. we all sort of sat down and divided up shopping and other non sailing tasks. We were mostly on foot in Tropea our city of debarkation. Those of us who were into cooking divided up the days and meals and shared the cooking. Those not into cooking defaulted to KP! When anyone shopped or bought extra goodies to share we took all the receipts and stuffed them into a drawer. Our designated comptroller, who in real life is a programmer, loved keeping us up on our daily budget. So, we all knew how much we owed at the end for foods, liquors, treats and such. It w as trip of a lifetime and boy I would do it again. We all had so much fun together that we had several parties afterwards. Thanks for this post. We are getting ready to live aboard for the nex year and this was very helpful. Really enjoyed your post. We plan a month-long cruise this year and have been putting together my provision list. Your information really helped. I love to cook,we love to ‘dine’, and I am having fun with the challenge to preparing meals with our 1-burner alcohol stove (cockpit BBQ too), teeny sink with hand pump faucet and about 6″ of counter space. Thank you for the wonderful information. We have just purchased a 34′ Grampian that we are restoring and just about ready to set sail. We will be sailing from Kemah to the Florida Keys. This is our first time to go on long trip so your info was very helpful. We are so excited to be at this point in our lives to walk away and let others keep our business going while we go play. Rick is 56 and I’m 52. We are about to embark on our springtime week-long sail of the Chesapeake Bay (we do it twice a year). it is SO good to have found your blog. I’ve always struggled with shopping and planning, and we end up eating ham sandwiches for b/l/d … Nice to have your blog in my pocket…. what a thrill it’ll be to surprise everyone this year!!! I’m so happy to hear my post helped you plan for your annual vacation! When I left for the Bahamas I was a complete sailing novice but my experience in the kitchen allowed me to help make the vacation better for everyone! I hope you had a great time, come back to tell me about it, if you feel like it! Wow….love this and going to use it. We sail on a 37′ in the Chesapeake Bay and starting our week vacation next week with our five year old. Definitely going to use many of your recipes for our week adventure. Thank you…you gave me some great ideas! Happy sailing. What an amazing vacation plan! I would love you to tell me about your trip when you come back. HA! No worries, not one but two jars of Kraft PB were first in my suitcase :) No Nutella though! We went for marmalade and jam instead. Finally, I can’t stop looking at the picture of that beach. Thanks so much for sharing your adventure with us! Great post! 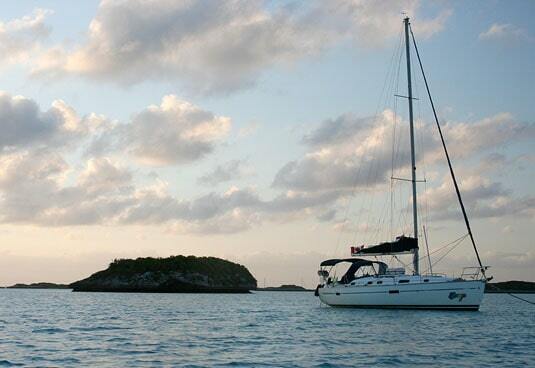 My parents live on a 49′ sailboat and are taking off cruising for two years this June. I go crazy trying to cook on the boat whenever I visit- but my mom has it down perfectly. She never fails to blow me away! Hi Renai. My husband wants us to take 2 years off and go sailing around the world. I am not thrilled about the idea ( to say the least !). Did your mother experience similar doubts and if so, how did she deal with it ? Where are they cruising ? Beautiful post, Marie! I’m ready to get my sea legs on and set sail for blue skies and white sand beaches. Thank you Nikki! Every comment I get reminds me how wonderful and relaxing that trip was. I wish I could go back just by snapping my fingers! I can’t begin to tell you how envious I am (in a good way)! Beautiful menus and fine cooking. On a sailboat. In the Bahamas. It doesn’t get any better than that!! When are you coming back to Roma? I really loved the opportunity to combine food & travel – once again! It was a great challenge and the best thing is that everything turned out delicious! As for Roma… Don’t tempt me! I wish to go back asap! I love this glimpse into your adventurous life. You’re living for all of us at home, right now anyway =) Looks like you had an amazing experience on the boat. Were you all in the middle of the ocean the whole time, or did you skip along coasts? Great post!! I’ve done some extreme cooking, like 10 days on a glacier in Alaska, and I will ditto everything you say.